NEW YORK (Reuters) - New York City's 1.1 million public school students were allowed for the first time in years to take their cellphones to school on Monday, when a controversial ban on them was lifted. Mayor Bill de Blasio said in January that he would seek to end the ban, which was imposed under his predecessor, Michael Bloomberg, and was in effect since at least 2006. Parents had complained of being unable to reach their children, who had to scramble to find places to store their phones during the school day. "I think it's way past time for this ban to be lifted," said Mona Davids, who heads the New York City Parents Union. 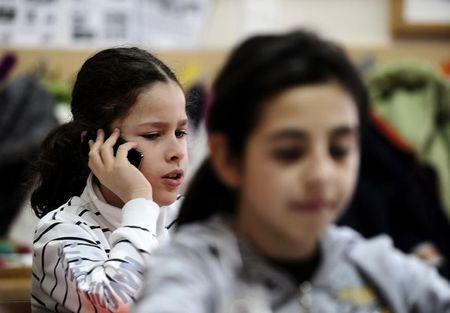 Schools in major cities across the United States, including Boston and Los Angeles, have policies that limit the use of cellphones in schools but still allow students to carry the devices if they are powered down. Davids and other parents have complained that New York's old policy endangered students by making it difficult for them to call for help in emergency situations and to connect with their parents before and after school. They also said the ban unevenly affected poor and minority students, many of whom attend schools with metal detectors that can catch cellphones. To deal with the phone restrictions, many students chose to stash their phones during school hours at small groceries and storage trucks. The fees of about $1 a day cost families about $180 a year per phone, de Blasio's office said. The ban was imposed on the grounds that cellphones can be a distraction and a safety hazard, making students targets of theft. The governing body for the city's Board of Education last month approved the new policy, which allows each school to develop its own rules around phones and other electronic communication devices for students.